Synonyms: Cynoglossum marifolium Roxb., Bothriospermum marifolium A.DC. Seaforth Heliotrope is a rough herb, with branches procumbent, radiating from the rootstock. Leaves are 6-12 x 3-14 mm, lanceshaped to elliptic, base and tip pointed, strigosely hairy, nearly stalkless. Flowers are borne in in leaf-axils and at branch-ends in few-flowered short cymes up to 2.5 cm long. Sepals are 5, about 2 mm long, triangular. 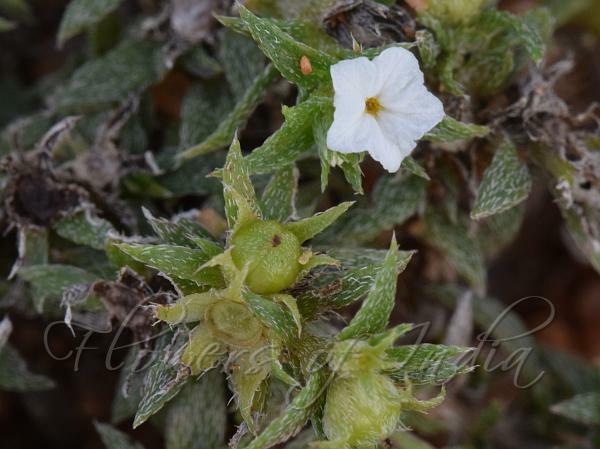 Flower are white, about 3 mm long, salver-shaped, hairy at throat. Stamens are 5, included, nearly stalkless. Ovary 4-lobed; style short, about 0.5 mm long. Stigma conical. Fruit is 4-lobed, shorter than the persistent calyx, spherical, eventually separating into 4 nutlets. 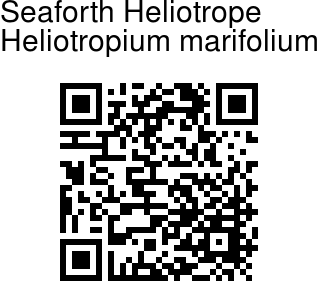 Seaforth Heliotrope is found in Peninsular India and Sri Lanka. Identification credit: S. Kasim Photographed in Tirunelveli, Tamil Nadu.